What might the NEW New Town resulting from climate change look like? 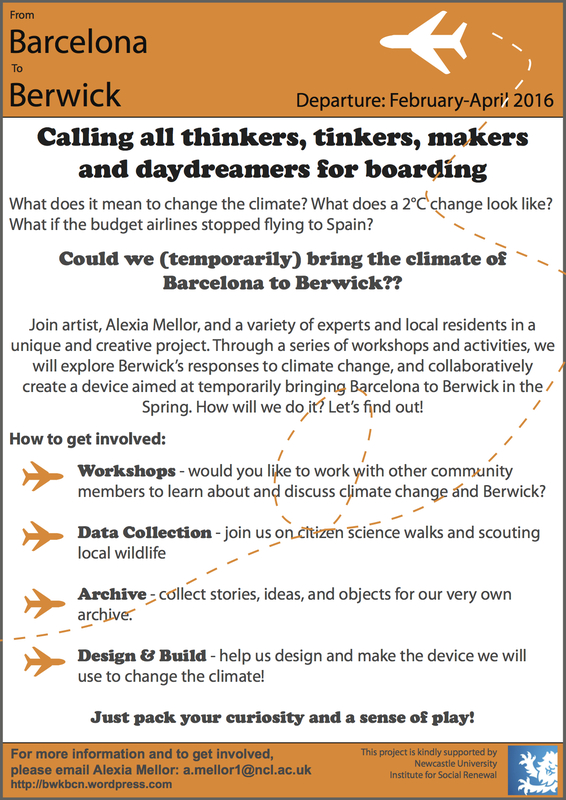 BWK-BCN merges a fictional airport code for Berwick-upon-Tweed and the actual airport code for Barcelona in order to create a new form of conurbation: a cultural merging of sites as an adaptation to climate change. BWK-BCN is a project forming my PhD research into how participatory art practices might reveal ways we experience global issues at the local level. Through a series of workshops and events, residents in the border town of Berwick-upon-Tweed, just 2 miles south of Scotland, explore how we experience climate and how this impacts our understanding of place. Together, we imagine what Berwick might be like if it had merged with Barcelona and had a Mediterranean climate. What foods might we grow and eat? How might understandings of heritage change? How might we rethink infrastructures?